Here are a Few of the Best Day Trips From Split! Let us guess – you’re in Split, Croatia and you’re saying “pfffft, seen this place – let’s get out of here and see more”. Right? Perhaps you haven’t left yet and you’re trip planning? 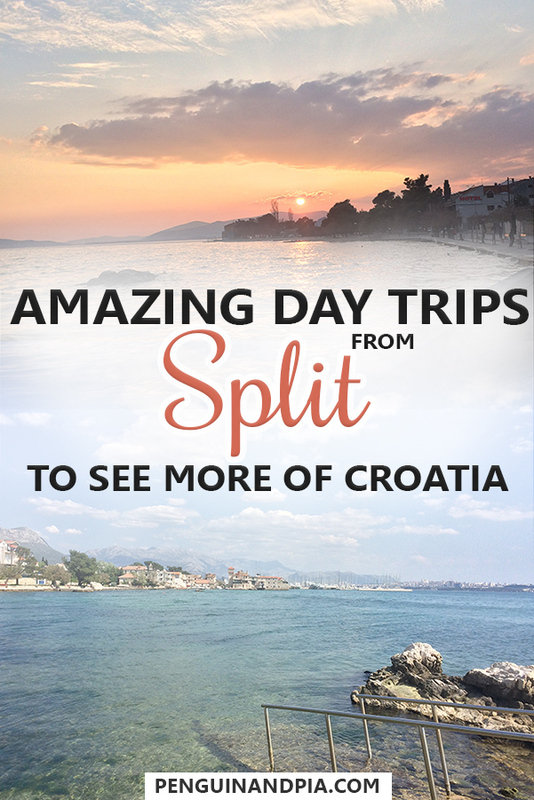 Whatever your reasoning, there are so many day trips from Split that you can go on. From swimming in stunning waterfalls at Krka National Park, making a day trip to islands from Split, or even wandering the historic old town in nearby Trogir, there really is a day trip for everyone. Croatia just has so many top attractions. Not to mention the classic Split to Zadar day trip just up the Croatian coast! If you’ve got your own car, getting around is easy. In another post, even help you plan the best road trip around Croatia for any length! If you’re really ambitious, you could even make the day trip from Split to Dubrovnik – but that’s a FAR journey for just a day. We’ll cover how to get from Split to Dubrovnik in another post since there are lots of ways to make the journey! All that said, we lived just outside of Split for a few weeks (in the Kastelas, see below) and had the chance to do most of these day trips. For a few of them, you’ll even find longer guides so be sure to check them out for all the details and our experiences! Here are some of the best day trips you can take from Split. As you will see below, we usually give lots of different options for completing these day trips from Split. That said, the bus or a guided tour doesn’t always allow for the best flexibility. In many cases, having a rental car can make things easier logistically. Generally, cars allow you to travel to off-the-beaten-path locations that are not easily reachable by public transportation. That said, there are a few things to consider if you want to rent a car in Croatia. Driving in Croatia is done on the right – like in North America. Also, many cars will likely be manual transmission. So, you need to rent an automatic car for your Croatia trip, double check the order and the specs on the car before you sign and pay! You can compare rental car prices across different companies here. This was shot near our Airbnb on a wander one day. Ah, the Kastela. What is there to say besides the fact that we loved living in one! The Kastelasare a series of 7 old towns that were settled along the coast. Their primary purpose was for defensive positioning to fend off the Ottoman Empire during the 15 and 16th century. Well, the Turks never came, and over the years, people have moved from Split to these areas making them more and more populated but still definitely quiet and full of old town seaside charm. We stayed in Kastel Kambelovac in an Airbnb – and the seaside was literally 6 metres from our front door. It was paradise for a few weeks. Morning coffee at the little patio table was staring straight into the sea. It was honestly amazing. 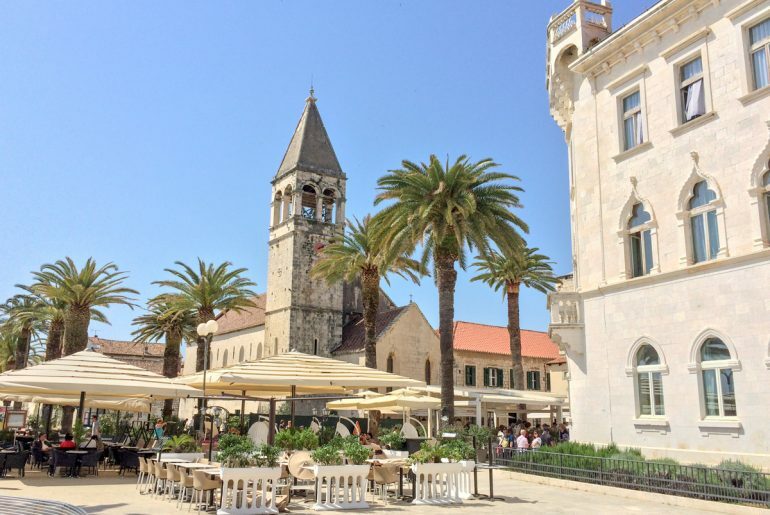 So, if you are staying in Split, we’d definitely recommend a day or half day trip to check out some of the villages. To get to them, you can take the bus Nr. 37 that leaves from the local bus station (not the one by the ferry harbour!) and get off at any stop in Kastel Gomilica, Kambelovac, Novi, and Stari – to name 3 of the 7. From any of these, you can walk along the water edge from one Kastel to the other and see the beautiful houses/explore what the villages have to offer. You can also stop and rest at some of the nice beaches in the summer. Just be sure to bring your bathing suit and towels if the season allows for swimming and enjoying the sun! If you want to see how beautiful the area is, watch the video snippet below. To see the full video head over to our YouTube Channel. Skradinski buk – the waterfalls. Yeah, they are really beautiful! Krka National Park is that day trip that Lisa was dying to go on the entire time we were in Split. Finally, like all good procrastinators, we visited in our last week there. This proved to be a great decision! Krka National Park is about an hour by car from Split and located in the county called Šibenik-Knin. We really enjoyed our time there – the waterfalls are absolutely beautiful. If you go at the right time you can even swim there which must be an amazing experience. Unfortunately, we went too early in the season so swimming wasn’t allowed yet. Eric was pretty bummed but we will be back someday! We took the bus to Krka after much debate about renting a car, going on a tour, or taking the bus. 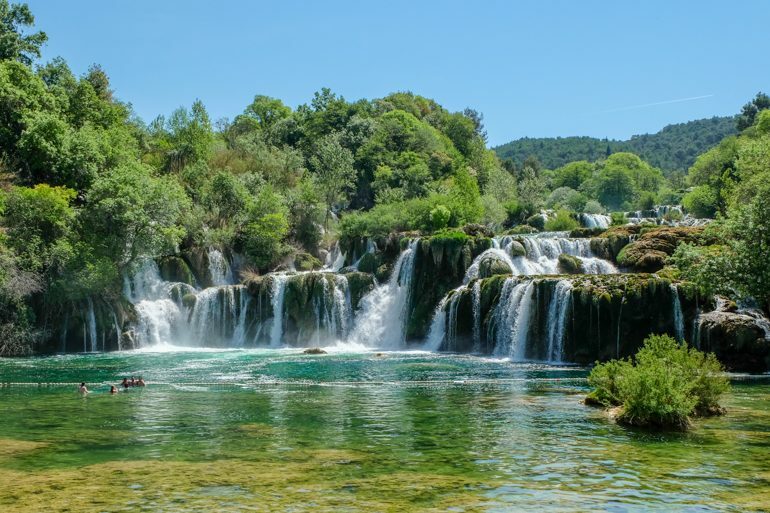 If you would like to learn more about the National Park and about important information like park fees, schedules, and the options to get there, read our full post about Krka National Park. Pia’s Tour Tip: Here is a top-rated tour from Split to Krka National Park for you to check out! We have heard of this place a ton but unfortunately didn’t get the chance to check it out personally (we only drove through it on our way from Dubrovnik to Split). We still wanted to include it since it seems worth a visit. Omis is a small town not far away from Split. By car, it only takes about 40 minutes driving south along the coast. if you are interested in physical activity this is the perfect place. You could go zip lining, hiking or participate in a number of water sport activities. Of course, you can also just discover the city and relax on the beach – the Omis Riviera is supposed to offer some of the nicest beaches in the country. Trogir is full of beautiful architecture. Trogir is a nice little city not too far from Split. You’ll actually pass the Split Airport on the way to Trogir from Split, fun fact. Go to the local bus station in Split and hop on the bus nr 37 (also goes to the Airport). You’ll get off at the last stop – which should take between 30 and 45 minutes. 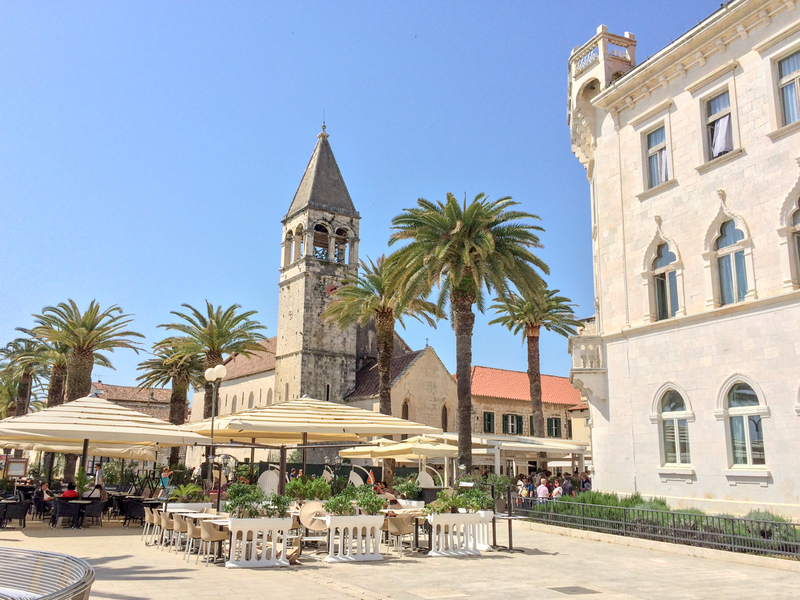 Trogir has a beautiful old town that is kind of a small version of the one in Split. You can (almost) get lost in all the little side alleys and discover hidden gems along the way. There seem to be some good restaurants – just be careful with the overly touristy ones (prices can be a lot higher than the norm). Since we lived in the middle of Split and Trogir, we decided to walk to Trogir. Afterward, we can say: DON’T do it. The first part of the walk was beautiful (through some of the Kastelas mentioned above) but the second part didn’t have a pedestrian walkway at all times so it is not recommendable! Short Story: Eric went to Zadar in 2013 because it was the cheapest flight out of the UK from Gatwick Airport for a weekend trip. He had a super great time. Years later, it was funny to stay down the coast from Zadar – a place he visited when he was still pretty “fresh” to travelling around Europe. My, how times change. As we mentioned, Zadar is not too far from Split so it makes for a perfect day trip. Like many other places, the old town is really beautiful and the coastline is just as gorgeous. If you decide to rent a car you can drive along the coastal roads and stop on the way. Alternatively, there are also buses going from the main Split Bus Station to Zadar quite frequently. Boat rides are always fun. That’s the village of Komiza in the background! Lots of people who go to Croatia rave about boat trips from Split and wanting to explore the Croatian Islands. And we mean, understandably so. We did an island hopping adventure day and absolutely LOVED it – we even wrote a whole post about it. We travelled as part of a tour, but admittedly it is impossible to organize something like that yourself. On this day trip, we visited the islands Hvar, Biševo, Vis, Ravnik and Budikovac. 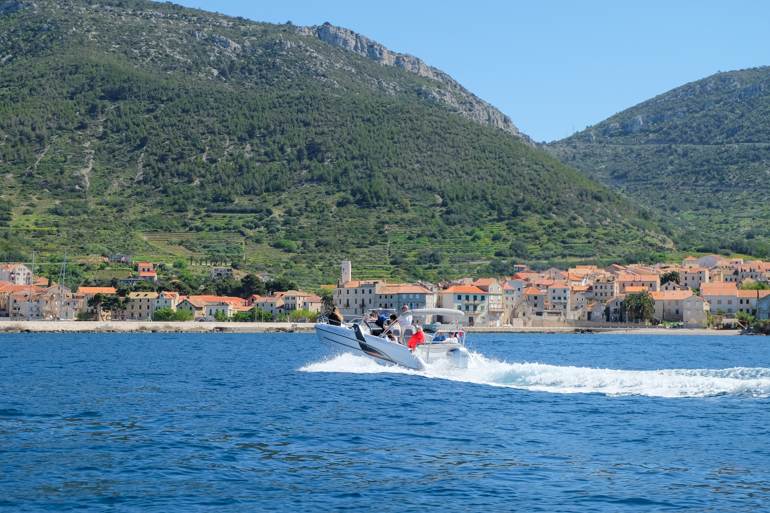 So, if you want to read more about the details and watch the video, check out our post about this adventurous day island hopping in Croatia. We stopped in Sibenik on our way from Krka National Park, but you could also make it its own day trip. It is easy to reach by bus and only takes about 1.5 hours – 2 hours. Sibenik is a smaller city than Split but from what we could see (and have heard) there is still lots offered there. While there you should check out the cathedral (it was built in the 15th century so it’s quite old) and the Fortress on top of the hill (you do have to pay for it though!). Sibenik also has its own harbour and a beautiful old town where you can find quite a few old churches and monasteries. This is perfect if you are interested in historic buildings and want to see more than just Split. There is also a beach very close to the city centre if you want to take a break for a couple of hours. The hike to the Fortress was worth the view! If you don’t want to visit multiple islands in a day, you could always just visit the island of Hvar in a day trip. Depending on the season you’re visiting Croatia, the ferry times might not line up perfectly, so you’d have to make it an overnight stay to actually see enough of the island. You can find the timetable for the Split – Hvar Ferry here. We can recommend hiking up to the castle as the view of the old town and the harbour is pretty amazing from up there. Also, walking through the cobblestone streets of the old town is fun since you never know what you’ll find behind the next corner. There were some good looking restaurants that we would have liked to try, so there will be no shortage of food while you’re there. 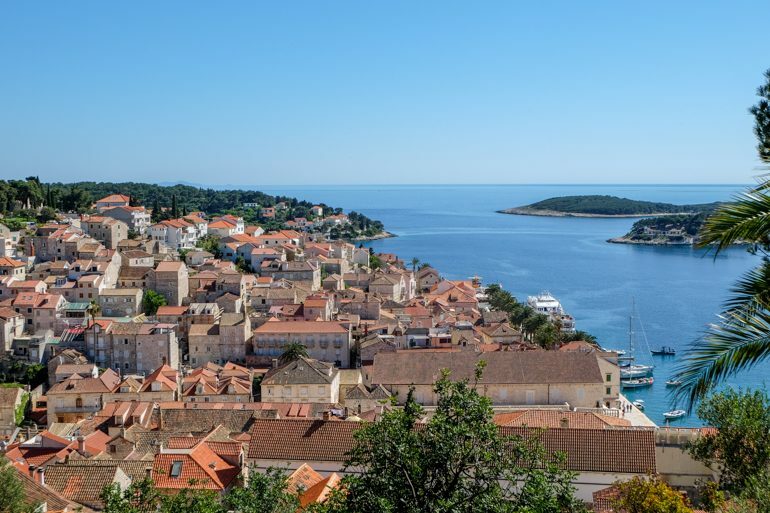 You can also read a little bit more about Hvar in our recent post on things to do and see in Hvar since we’ve had the chance to put one together! As another beautiful National Park close by, day trips from Split to Plitvice Lakes are a common occurrence. Plitvice is a little bit farther north than Krka National Park. We didn’t go but know lots of people who have been and absolutely loved it. To get there by car, it takes approximately 2.5 hours from Split. Since you’ll be passing pretty close to Zadar you could also make a pit stop there if you have enough time. It can be difficult to get there by local buses since it is quite far and the area where the park is located is not that densely populated. However, bus companies offer direct trips from Split to the Plitvice Lakes. You can check out the schedule on the Bus Croatia Website. In contrast to Krka, you can’t swim anywhere but the beautiful nature is definitely worth seeing. It was Croatia’s first official national park as of April 8th, 1949 and has been a UNESCO World Heritage Site since 1979. You can actually go ziplining there which looks pretty cool. Here is more information on the official website for Plitvice. Penguin and Pia’s Tour Tip: Check out waterfalls at Plitvice Lakes National Park on this day trip from Split! Mostar, and Bosnia in general, stole our hearts a little bit. Visiting Mostar is a day trip you might not think of at first since it is in a different country. We visited Mostar on our way from Sarajevo to Dubrovnik, but you can definitely also make it a day trip from Split. 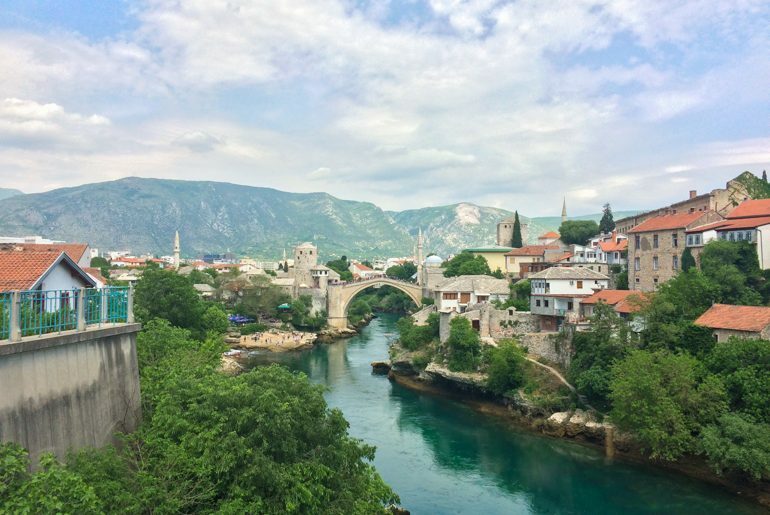 We wrote a whole guide on visiting Mostar if you are curious! In fact, a Split to Mostar day trip actually seems to be a thing since we saw a ton of groups arrive in the morning and then leave again in the evening during our time in Mostar. Both Dubrovnik and Split seem to be popular places to leave from on a trip to Mostar. Penguin’s Tour Tip: Here is a top-rated tour from Split to discover Mostar and Medjugorje! 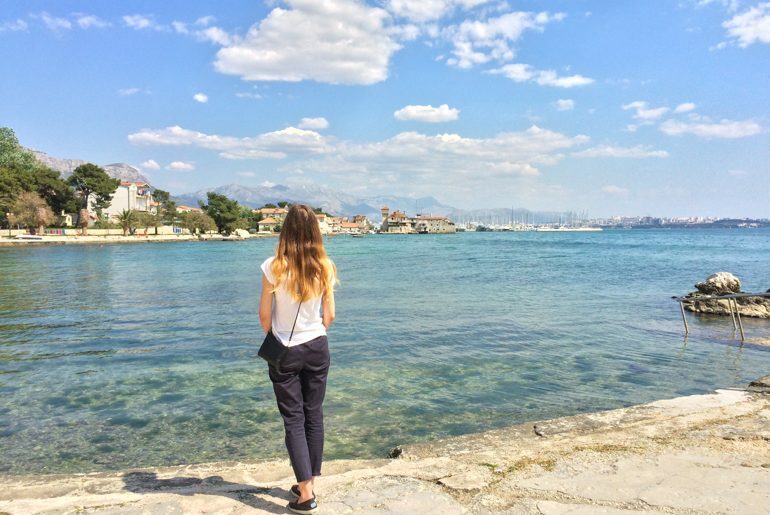 And there you have it – some of the best day trips from Split! We’re glad we did the ones that we did but, of course, we’re super curious to check out the other places and sights that we didn’t make it to! Have you been to any of these? Are you planning summer travels to Croatia? Be sure to connect with us if you have any questions – we’re happy to chat about travel plans! As always, Happy Split Day Trip Waddlin’!